Terracotta tiles become naturally more porous over the years, allowing watermarks and stains to set in. Therefore, it's vitally important to maintain your terracotta tiles if they are to stay look as good as the day they were installed. 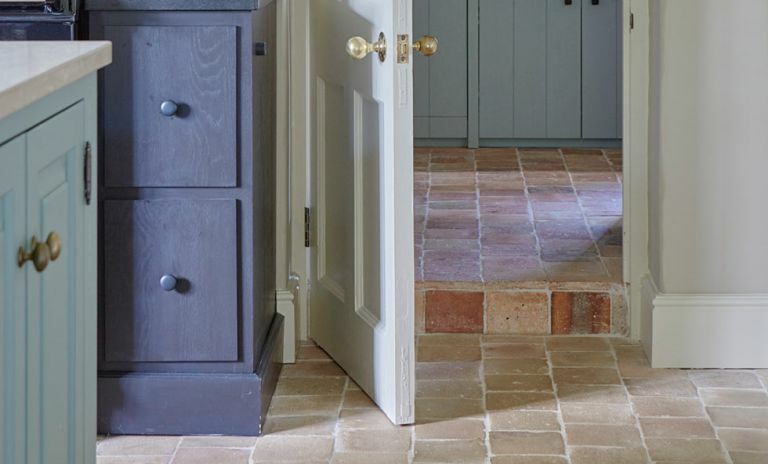 Here's how to clean and reseal terracotta tiles to protect them for the future. If cleaning terracotta tiles is part of a bigger renovation project, find out everything about renovating a house in our expert guide. Find more cleaning tips, advice and step by steps on our dedicated hub page. Test your terracotta tiles for porosity by placing water in the middle of a tile. If, after 15 minutes, the water has soaked into the floor, the tiles will need to be impregnated with boiled linseed oil. This will darken the tiles a little so, to get an idea of the finished colour, wet the tiles to assess the effect. As these tiles have been laid on top of a damp-proof membrane it’s safe to apply a floor sealer that will merely require sweeping or vacuuming to prevent dirt and grit becoming ingrained. An occasional wipe with a damp mop will freshen up the finish – check every year whether your tiles are becoming porous again. To choose the best mop, consult our guide to the best mops for tiles. Use a solution of 25 per cent stone floor cleaner in a bucket of warm water. Apply lightly with a mop or sponge. Leave to work for 15 minutes or so, then give the floor a good scrub. On stubborn stains apply the product neat. Wipe off dirt and grease and rinse with warm water. Use an old towel or dry mop to dry the surface. Allow the tiles to dry thoroughly before applying the oil. I left the floor for three days, putting down dust sheets to protect it from spills. I then vacuumed the floor paying particular attention to the grouting and any nooks and crannies that might be harbouring dust that could spoil the finished floor. Boiled linseed oil is the traditional finish for these unglazed tiles and gives a soft sheen. To encourage the oil to be absorbed into the tiles leave the can in a warm place overnight and choose a warm dry day or put some heating on a few hours beforehand. Apply the oil liberally with a paintbrush. Wait for about 20 minutes and check whether there are pools of linseed oil lying on the surface. If there are, take your brush and go over the floor redistributing the surplus oil. When you’ve finished wipe the brush on a rag to take off as much oil as possible and clean with white spirit. After another 20 minutes take some rags and wipe away any oil that remains on the surface. If this is allowed to remain it will congeal, stay sticky and attract dirt and dust. Leave the tiles for at least eight hours before applying a second coat. Oily rags can pose a fire risk. Lay them outside to dry before disposing of them. Wait at least 24 hours before applying a protective coat of stone floor sealer using a brush. Make sure that the product is oil rather than water-based, as a water-based product won’t be suitable for applying over the oiled tiles. The choice of a colour enhancer seal brings out the warm clay tones. After eight hours, test whether the tiles are still porous by spilling a few drops of water on to the floor. After 10 minutes check whether the beads are still proud or whether they have slumped. If the tiles are absorbing rather than resisting the water, apply a second coat of finish. Leave for 24 hours before using the floor.